My wreck shot on display at the NEC Dive show. It's always fun to seen your own shots printed big and used for something interesting. 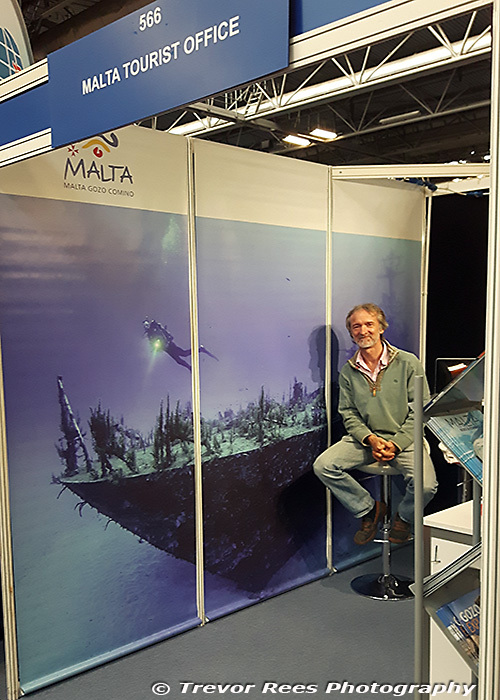 Here, my photo of a former East German minesweeper ship, the P29, is providing a backdrop for the Malta Tourism stand at the NEC dive show. The wreck was scuttled just off Cirkewwa in Malta on 14 August 2007. It now lies upright on the sea bed at a depth of around 35 metres and is a popular dive site in Malta. Nikon D600, Sigma 15mm, available light.